President Barack Obama hugs a woman in the crowd after addressing the Labor Day celebration in Detroit, Mich., Sept. 5, 2011. Supporters danced in the streets when Barack Obama was elected president in 2008. Record throngs attended his two inaugurations, and almost everywhere the president has gone in the last eight years, people have strained to get close to him. As Obama prepares to leave office, The Undefeated is chronicling the cultural impact of his presidency in a series of essays called The First Black President. As part of that series, we want to know what the Obama presidency has meant to you, our readers. If you have met the president or first lady, attended a speech, or just seen his motorcade pass by on the street, please upload your best selfie, photo or video documenting your brush with history with the hashtag #EncountersWithObama. We’ve included some examples below. Please include your name, a description of where and when the photo or video was shot, and a short explanation of 100 words or less about what that moment meant to you. The Undefeated will collect and display the recollections and use them to form an essay about our readers’ personal encounters with the Obamas and what they meant to you. Share your #EncountersWithObama on Twitter, Facebook and Instagram. Anre Washington (far left) during commencement day at Morehouse College on May 19, 2013. Washington, the president of the school’s Student Government Association (SGA), met Obama on Morehouse’s commencement day in 2013. Morehouse College provided me with the unique opportunity to connect the pedagogical legacy of Martin Luther King Jr., the utility of an HBCU (historically black college or university) education and my Morehouse brother, along with the historic nature of Barack Obama’s presidency in one experience at my commencement in 2013. 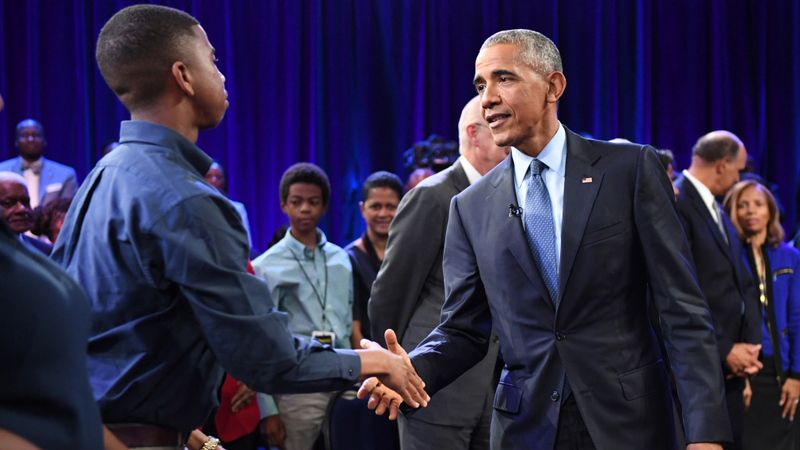 As a young African-American male who is deeply involved in politics, it’s hard to overstate the profound impact of coming of age during the era of President Obama. As the Morehouse SGA president, getting to meet President Obama was unquestionably a big event for me. But what stands out to me is his challenge to use the power of being a Morehouse Man for “something larger than myself.” I’ve carried those words with me, both personally and professionally. This moment in history is filled with complex and deeply rooted social challenges. That charge has translated into my professional work in children’s advocacy and policy, and helping run a small nonprofit for limited-access, high-potential boys. I hope I do justice to the charge that both Morehouse College and President Obama gave to me that day. She met Obama when he visited the university on Oct. 11 to take part in a televised town hall meeting with The Undefeated. As I was standing on the edge of the front row, the president came by as he greeted individuals who were anxiously hoping to shake his hand. When he arrived near me, I shouted, ‘President Obama, will I see you at the wedding?’ Shocked by a question that I know he rarely receives, he looked toward me, grinned and asked, ‘What wedding?’ One of my godchildren used to serve first lady Michelle Obama as her social secretary, and I was privileged to function as a parent to this young lady after the unexpected passing of her parents while she was in elementary school. So my response to the president was simply, ‘Kristen,’ to which he responded, ‘Who are you?’ After briefly informing him of my relationship with Kristen, he leaned over, and it happened – he kissed me! I can say, without question, meeting the president was one of the most rewarding experiences I’ve ever had in my lifetime, and it is truly something that I will never, never, never forget. His presence on our campus, and the fact that he chose my university with his presence is something that makes me very grateful and proud. Personally, as I looked across the room, I don’t believe there was a single person present that was not comfortable around him. Yes, we were all excited, but because he was so down to earth, it made everyone feel so at ease during his visit. I never thought that in my lifetime I would even see a black president, so I definitely never thought I’d get to meet or kiss one! President Barack Obama shakes hands with audience member Jordan Greene after ESPN’s The Undefeated’s A Conversation with The President: Sports, Race and Achievement at the Alumni Foundation Event Center on the campus of North Carolina A&T State University on Oct. 11 in Greensboro, North Carolina. He met Obama after The Undefeated town hall meeting on Oct. 11. At the age of 13, I had the opportunity to be at President Obama’s first inauguration. At the age of 17, I witnessed my role model be re-elected as the president of the United States. At the age of 21, I had the honor and privilege to be in the same room as him as he discussed his solutions on the topics of race, sports and achievement. Today is a day I will never forget! President Obama did a phenomenal job of delivering his message. I think it’s safe to say that he made the entire audience realize that it’s not about you. If you truly want to make an impact, you have to think about the bigger picture and do what’s best for the people and not just you. 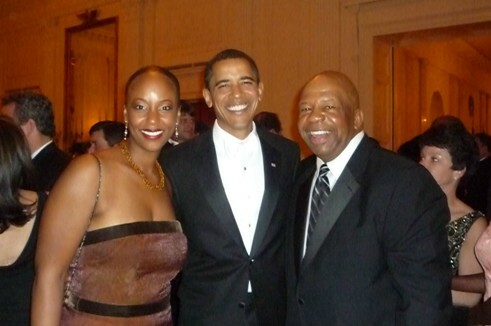 Maya Rockeymoore (left) and her husband, U.S. Rep. Elijah Cummings of Maryland, flank the president on inauguration night in 2009. 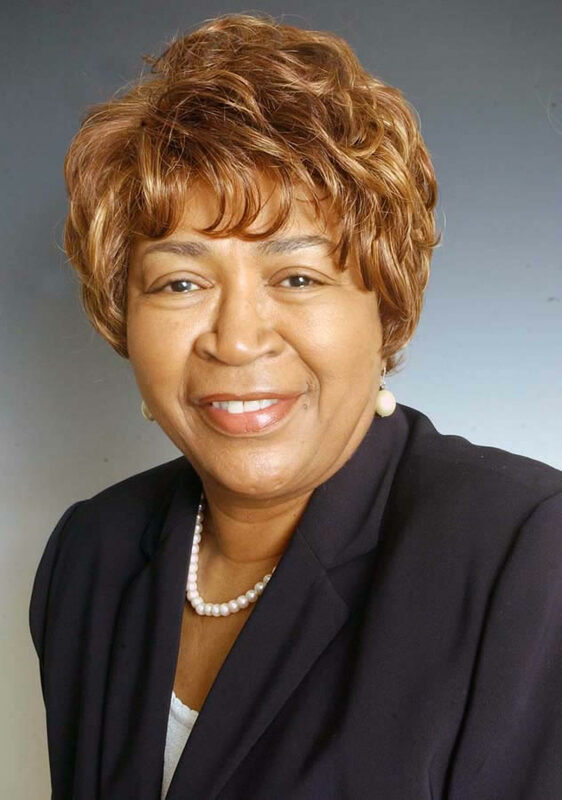 She met Obama for the first time when he was in the U.S. Senate. But she met him for the first time as president at the White House on inauguration night in 2009, after the president and first lady had made the rounds of inaugural balls. My former boss, U.S. Rep. Charlie Rangel, introduced me to Barack Obama while he was still the U.S. senator from Illinois. After a brief chat about his book and the fact that his sister and I share the same first name, I thought him to be nice and personable. When he became the president of the United States, my assessment of his personality didn’t change, but my understanding of his significance did. For me, his ascendance to the position affirmed that there are no outside forces that can keep you from your destiny; we are bound only by the limitations of our own thinking; preparation, discipline and determination can take you to seemingly unimaginable places, and there could and should be many more black presidents in our nation’s future. Rasool Hinson (left) in dark pants and a purple T-shirt. 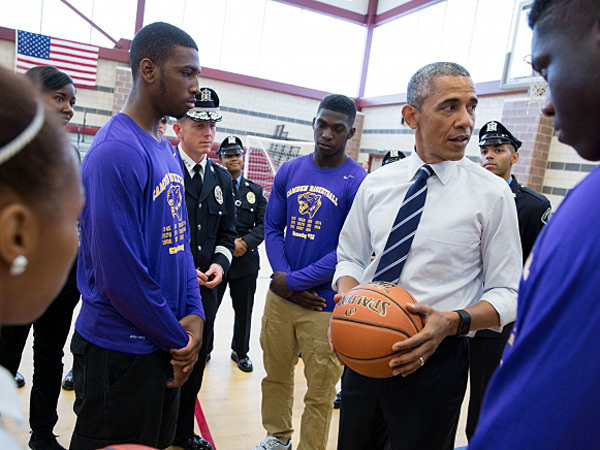 Hinson was in high school when the president visited his hometown of Camden, New Jersey, in May 2015. Meeting the president was actually a different experience — different from anything I had ever done. I was thinking, ‘Here I am with the first black president.’ I was having different conversations with him. You could tell he was a good brother. He was down to earth. We played basketball. We played knockout with him. He could shoot it a little. I was thinking, in my mind, not many people get this opportunity. I thought about people like my grandmother, who has seen so much, and how much that meant to her, and how she could go brag to her friends that her grandson played basketball with the president. And she did.